Ghana's disappointing performance at the 2014 World Cup in Brazil should be investigated, the country's president John Mahama has demanded. The eliminated west Africa nation finished with only one point from their three Group G games. 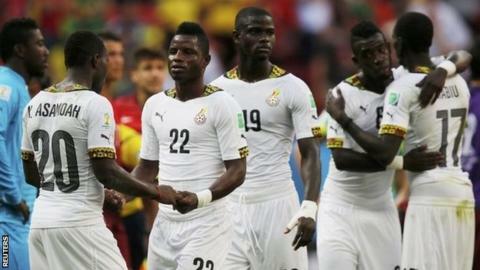 Ghana were also embroiled in a dispute over appearance fees on Wednesday. And on Thursday, midfielders Sulley Muntari and Kevin-Prince Boateng were expelled from the squad for alleged indiscipline. Ghana's only points in the World Cup came in a 2-2 draw against Germany in which Andre Ayew and Asamoah Gyan both scored. Four days later, the national government sent in excess of $3m (£1.8m) in a chartered plane to Brazil to pay the squad following their threat to boycott their final group match against Portugal if they did not receive their money. The players had boycotted training the previous day in protest. Last week, the president of fellow African nation Cameroon, Paul Biya, said an inquiry was needed into his own country's failure to win a group game.